Thanksgiving table decorations are a great way to add an element of the Thanksgiving season to your table. Let me share 15 Thanksgiving table decoration ideas with you all to make your table absolutely stunning this year. Best of all, these are inexpensive centerpiece ideas that won’t cost you a ton of money to make. Learn how to create stunning centerpiece ideas for Thanksgiving on a budget. These are effortless looks that can be made with the minimal money needed. What I love about this wood box fall inspired centerpiece is you can make this and use it year round. Just change out the flowers in the center to fit the season! This is a very simple but elegant look. If you have some jars already, this will make it an even more affordable Thanksgiving table centerpiece. 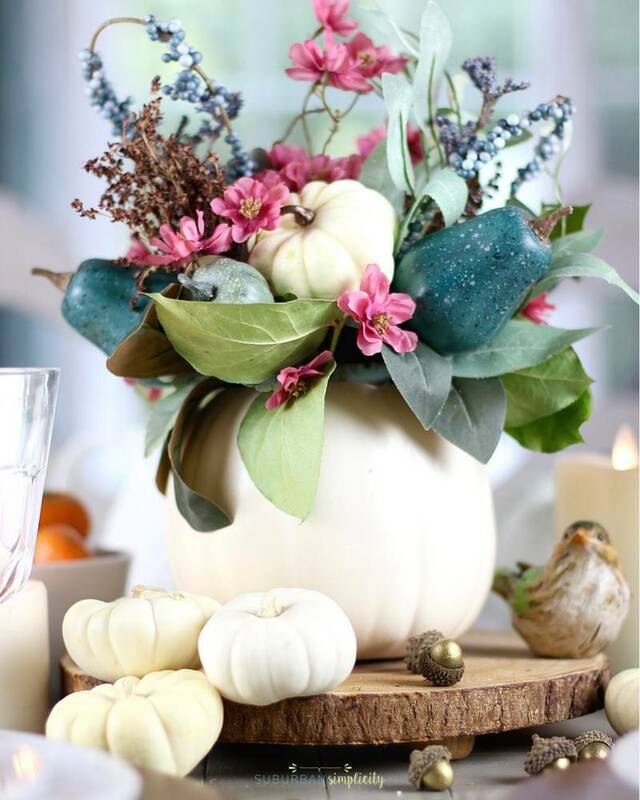 Take a faux pumpkin and transform it into a bright and stunning Thanksgiving centerpiece. I love the look of the white pumpkin, it is such a timeless look. Create a unique pumpkin that allows you to write what you are thankful for. This is a really fun idea so that the whole family can write what they feel they are thankful for the most. Here is a really fun idea, head out and pick some acorns or buy some, and then paint them up nice and bold in color. Put in a bowl or jar and place in the center of your glass. Take a faux pumpkin and create a succulent display with will brighten up and add some green to your table. This is a super easy and gorgeous way to dress up your table on a really small budget. Here is a really simple but easy centerpiece that can really add such color to your table. You could head outdoors and find some really great flowers or even leaves to add to your centerpiece to dress up the table. Grab some dried wheat and transform it into a classic centerpiece that will make your home feel like Thanksgiving for sure. Add some other small decor pieces around it, and you have a classic table decor statement with a modern twist. I am a huge fan of burlap so I was instantly drawn to this burlap floral centerpiece. Transform it to fit the colors of your home and the look you want to give your table a rustic and farmhouse feel. Looking for that quick and easy centerpiece to elevate your table? A quick centerpiece to dress up your table in a simple but stunning way. Here is a great table runner that is bursting with vibrant fall colors, the candlelight will add a nice ambiance to the room, and be a perfect table decoration to welcome your guests. Grab some pumpkins and flowers and you can have a really easy decoration but gives you a really modern and unique look. I am all about simplicity. Here is a really fun way to dress up your table for Thanksgiving in an affordable way. I love how clean and simple this look is, but adds the perfect amount of design to your table. They found these pumpkins at the thrift store and gave them a diy makeover and created a really gorgeous table display piece. I love the look of this white on white with the pop of orange. Really elegant and offers a nice element of style to the table. Plus once Thanksgiving is over you can re-use the candles over and over again.